Cement mortar with high mechanical strengths, powerful adhesion and resistance to frost, impact and abrasion, as well as moisture. Does not burst nor sag for up to 6cm/coat applications, without the requirement of any formwork. 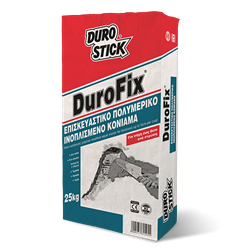 Suitable for all concrete repair works, for restoring broken edges in steps and balconies as well as columns and beams. Suitable for use as coving mortar for roofs. Classified as concrete repair product, in PCC R3 category, per EN 1504-3.